When the opportunity to film and meet some of the snakes of South Africa arose this January, there was no way I was going to say no to this!! I adore predators!! As you know I love wolves and sharks and well……snakes are a pretty big hit with me along with hyenas, lions, polar bears, black bears and…the list goes on. The reason I have a soft spot for predators is that many of them are not only persecuted and killed for what comes natural to them….which is predating, but also they are so important in keeping balance to the entire animal kingdom. Without our predators, every animal level further down spirals out of control, take for example man is now shooting the deer in the UK as they are complaining that there are far too many deer….. well, if they hadn’t annihilated the wolf and left him alone to do his job, then the deer numbers would not be spiralling out of control and other prey animals would naturally be kept in check as nature intended. I love my house spiders, I allow them to exist, as they keep flies in check (and before you say it, no I don’t have a fly infestation or anything). My local garden predatory birds do eat songbirds, but that’s life, that’s nature! They keep the numbers down of snails, rabbits, mice, toads, snakes, lizards, rats, grasshoppers, cockchafers, grubs, weevils, and other insects. Anyway, who are we to say who should eat what, who should live or die when the human population is at a 7 million breaking point? So, I love SNAKES! There you have it. They are amazing creatures, the ultimate survival machine and they feel wonderful to hold and the venomous ones command great respect. There are many extremely venomous snakes in South Africa and also loads of wonderful non venomous snakes. Sadly one of the non venomous snakes called the Mole Snake (pseudaspis cana) has been culled in its thousands due to some farmers suggesting that any snake is a bad snake, so venomous or not, often meet a grizzly end. Often mistake for a Cape Cobra, to the untrained eye, the mole snake, well, likes to eat mole rats. Although not venomous, they can be aggressive and with four teeth to the top and two to the bottom, they can deliver a nasty bite which may need stitching, so I needed to be careful while handling this little beauty. Coming in a whole variety of shades, from dark black to brown, I was thrilled with my mole snake encounter and let him free to go eat plenty of the mole rats in South Africa and looking at the amount of mole hills, another reason why this predator is so valuable. After my wonderful non-venomous experience, I was dying to meet a snake with a reputation which proceeded him. 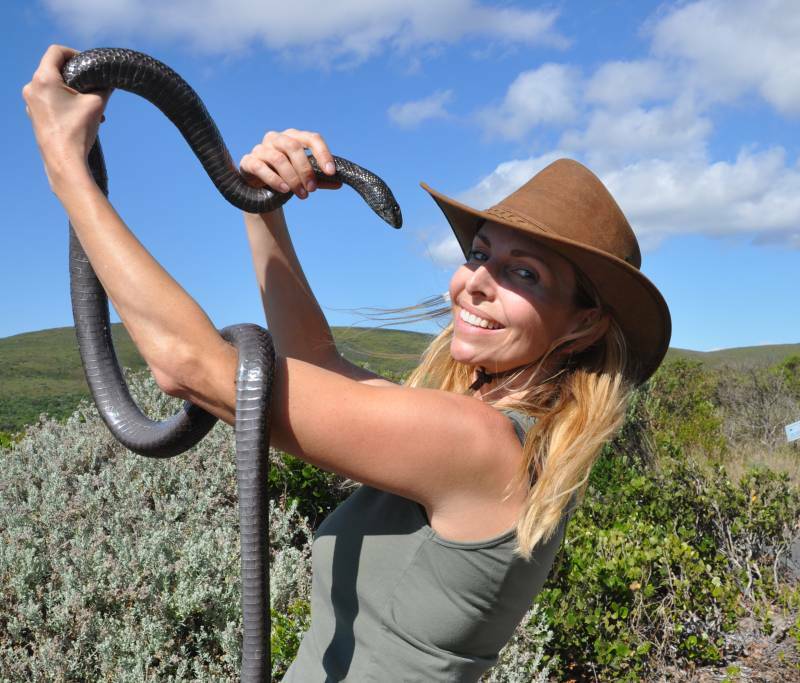 Everywhere I went, people spoke of this snake – the one which was accountable for the most injuries and bites in the whole of South Africa every year. Slow and camouflaged, this snake was an ambush predator, laying in pathways and in grass, well hidden away from approaching flip-flops. Due to his ambush characteristics, meaning he is not inclined to slither away fast, many locals have found their feet firmly attached to his fangs. Have you guessed it yet? Yes….its the PUFF ADDER (Bitis arietans). Not only does he possess a pair of very large fangs, they deliver a fast and mighty wallop when he bites and when the venom hits, its highly toxic, capable of causing massive tissue necrosis, hypotension, coagulopathy, thrombocytopenia, and spontaneous bleeding. The limb swells preventing blood flow and a surgeon or doctor may need to cut the limb open to relieve swelling while the wound heals. This snake was beautiful and if you are careful to look where you tread and not to pick him up, like I am doing (which incidentally I did under full expert supervision and with a snake handling hook) he should leave you alone. If you are bitten, get to a hospital fast, as you may loose a limb. Now I was desperate to meet a Boomslang snake (Dispholidus typus), which is Afrikaans for ‘Tree Snake’. Funny enough, I had been told that the ones down on the Garden Route were pretty chilled out compared to the ones around Johannesburg. One thing was for sure, they were beautiful to look at, especially the male of the species and every day I walked around the local bushes and trees, hoping and praying to find a Boomslang, but alas it wasn’t to be this trip. I have found some lovely photos of them to show you though and some interesting facts. 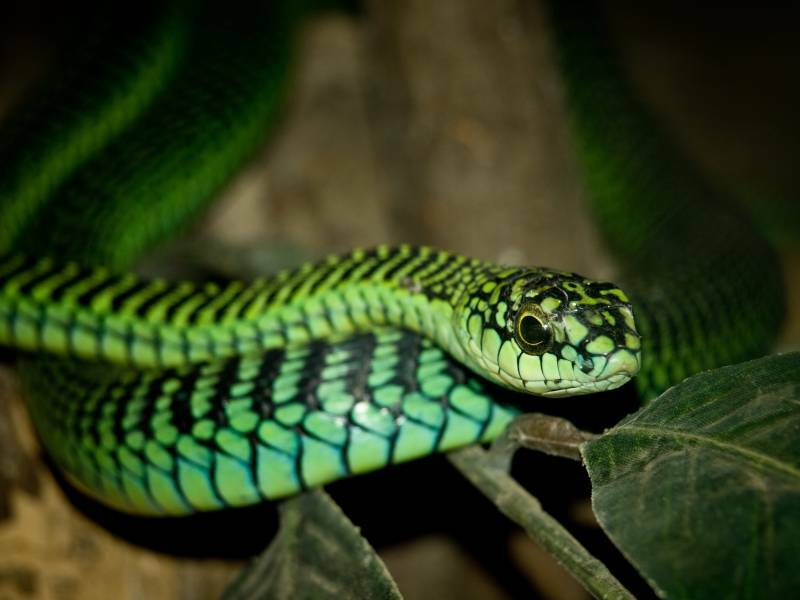 The Boomslang has a highly potent venom, which it delivers through large fangs located in the back of the jaw. 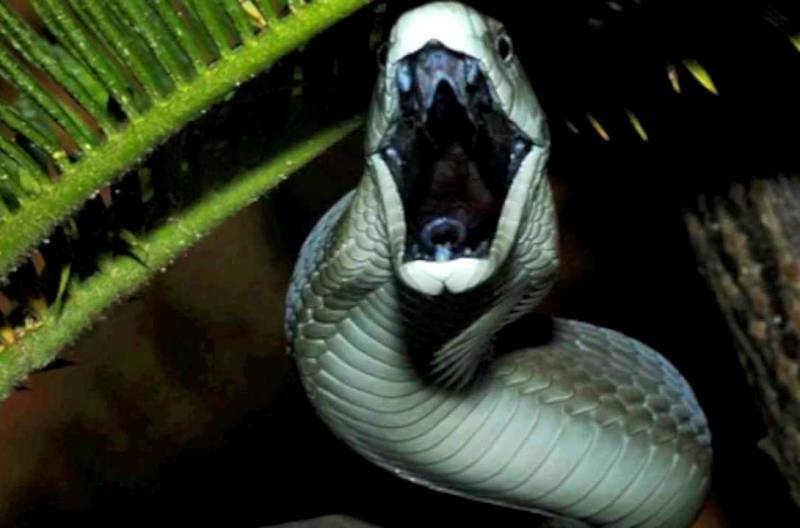 Boomslangs are able to open their jaws up to 170° when biting and the venom of the Boomslang is primarily a hemotoxin; it disables the blood clotting process and the victim may die as a result of internal and external bleeding. Males are light green with black or blue scale edges, but adult females may be brown. Now I could go on and on about snakes, but I think I will finish up with the namesake of the Rhino anti-poaching team I had been filming with in South Africa – The notorious Black Mamba (Dendroaspis polylepis). With a reputation for being the most venomous snake in South Africa, it does injure far less people than the Puff Adder, as it tries to slither away fast and avoids confrontation if at all possible. Beautiful, but deadly and with a name due to the unbelievable black colouration to the inside of its mouth. The venom of the black mamba is highly toxic, potentially causing collapse in humans within 45 minutes or less from a single bite. Without effective therapy, death typically occurs in 7–15 hours. The venom is chiefly composed of neurotoxins, specifically dendrotoxin. The black mamba is capable of striking at considerable range and occasionally may deliver a series of bites in rapid succession. Despite its reputation for being highly aggressive, it usually attempts to flee from humans unless threatened or cornered, so I would still keep your eyes to the ground for that Puff Adder, as its more likely that you will encounter one of these than a Black Mamba.